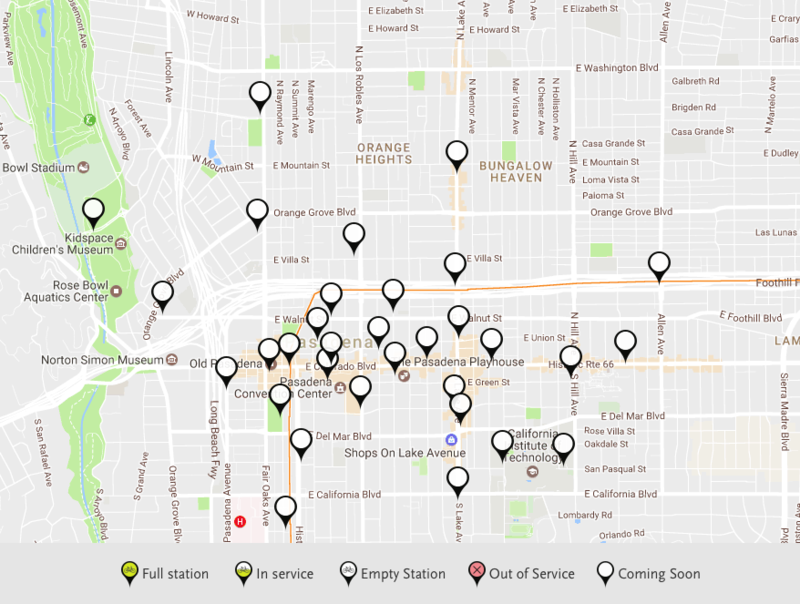 Metro Bike Share stations in Pasadena will be at the above locations. 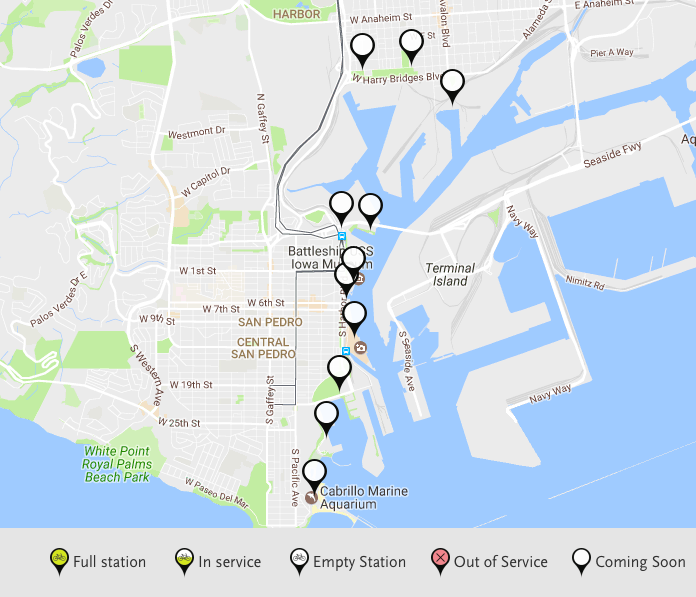 Metro Bike Share stations at the Port of Los Angeles will be at the above locations. Working closely with the cities of Pasadena and Los Angeles, the Los Angeles County Metropolitan Transportation Authority plans to launch bike sharing in Pasadena on Friday, July 14, and at the Port of Los Angeles on Monday, July 31. Metro will announce the date for its third bike share launch in Venice in the near future. The region’s bike share expansions will result in nearly 1,500 bicycles at up to 125 stations. Bike sharing is an ideal transportation option for people to get where they need to go for local destinations that may be too far to walk but to short or inconvenient to drive. Metro has worked with cities to strategically place bike share stations near Metro stations to encourage both bicycle and transit trips. Additionally, a single Metro TAP fare card can provide access to both Metro Bus and Rail lines and the Metro Bike Share system, making it the most integrated with transit than any other system in the United States. In Pasadena, Metro and its contractor, Bicycle Transit Systems, Inc., will install 30-plus stations throughout the city. Key destinations accessible via bike sharing will include Old Pasadena, Paseo Colorado, the Playhouse District, South Lake Avenue, Levitt Pavilion (Memorial Park) and Pasadena City College. Another key Pasadena destination will be the Rose Bowl. Riders traveling to and from stadium events will be able to take advantage of the bike share via virtual kiosk. Bike share at the Port of Los Angeles. Under Metro’s Bike Share business plan, Metro splits all costs with participating cities. Metro funds up to 50 percent of the program’s capital costs and up to 35 percent of the operations and maintenance costs. Metro originally launched bike sharing in downtown L.A. in July 2016. That system comprises 61 stations and approximately 700 bicycles throughout the downtown area. To date, more than 160,000 trips have been made on the system, with more than 380,000 miles traveled. Approximately 4,700 bike share passes have been sold. Metro’s bike share system has also helped removed more than 362,000 pounds of carbon dioxide from the air. Collectively, bike share riders have burned 10.5 million calories — equivalent to 10,000 pints of ice cream. Those interested in utilizing bike share are encouraged to sign up for a Metro Bike Share pass at www.metro.net/bikeshare. In celebration of Bike Month, Metro is offering a free month with code BIKEMONTH17 until May 31. When you look at it on the map, the San Pedro/Wilmington bike share looks odder than in text. Since the roads between the cruise ship terminal and Wilmington have lots of trucks and the shoulder “bike lane” on John Gibson Boulevard is not exactly conducive to bicycling by anything other than strong bicyclists, basically the three stations in Wilmington are going to be an island. It seems to just be a sop to place bike share in a disadvantaged community. Yet there are no stations along Gaffey or Pacific, where the bulk of the San Pedro residents live. The hills in San Pedro are no worse than those in Downtown Los Angeles, but there aren’t stations at key trip generators like the hospital, grocery stores, or the DMV. It would be fine if private money were being used, and if the Port wanted to squander their revenues that’s on them, but countywide tax money is being used for what will be an inevitable failure, like the bike shares in Anaheim and Fullerton were. I really hope the delay in Venice is due to smarter heads prevailing. Why on earth would Metro install an incompatible bikeshare system with the one that is on the ground already? Expand Breeze. The picture in this article with Pasadena City hall in it has a problem. It shows the rider with an improperly worn helmet. The strap is not tight, as it should be. Metro should not use it as a promotional picture.